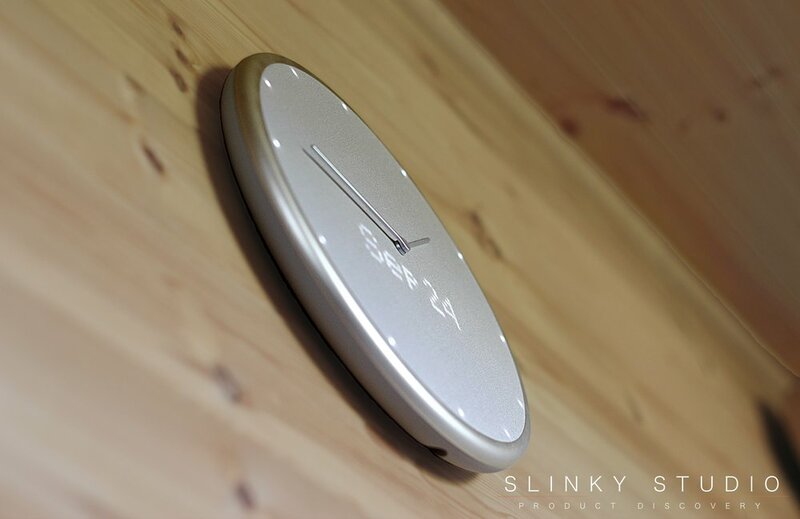 The Glance Clock integrates a humble wall hanging timepiece with the 21st century internet. But is the ‘world's smartest clock’ worth space on your wall? It’s not outrageous at all. The Glance Clock has a clean Scandinavian design with the familiar form factor and scale to those clocks already in many kitchens and offices. You may already be aware that this product started life as a much anticipated Kickstarter project; and whilst the Kickstarter brief and the real artefact that we have differ in terms of function and design, we think the company has something quite special on its hands in either silver (ours) or graphite colours. Under the cloth front are multi-coloured LEDs which emit messages and graphics for illustration. The clock's silver hands, married with illuminated dots to outline each hour, make sure the fundamental ability of telling the time at a glance hasn’t been lost. 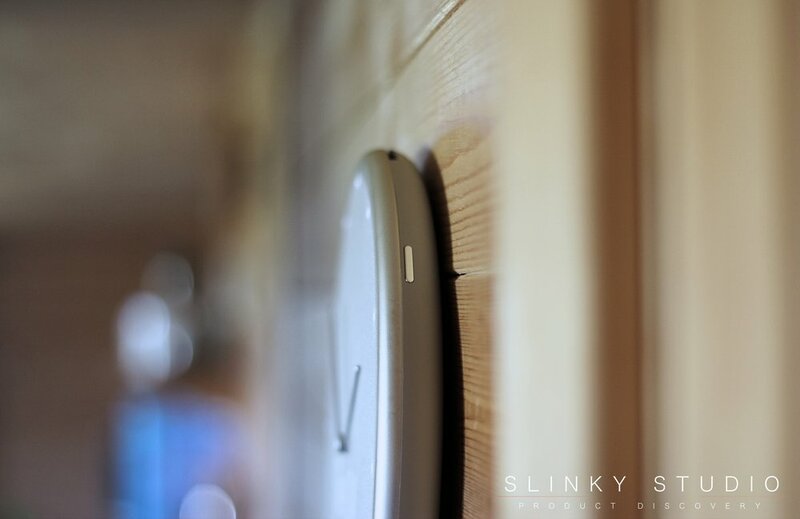 There’s an integrated battery that lasts for around 4-5 days at the studio before needing recharging via the included and slightly ridiculously long micro-USB cable; and due to the thoughtfully placed bottom charge port, this means we don’t have to take the Glance Clock off the wall when charging. It’s able, but has plenty of room for more knowledge. The Glance Clock App is the master control centre where we have access to timers, alarms, weather and other more interesting widgets that we’ll get onto shortly. But before that here’s a brief history of our experiences with this pre-official release clock. We received the Glance Clock a number of months ago and throughout our usage the whole experience has matured with App updates. It’s certainly not perfect yet, but the gleam of an enjoyable and purposeful experience is becoming clearer. 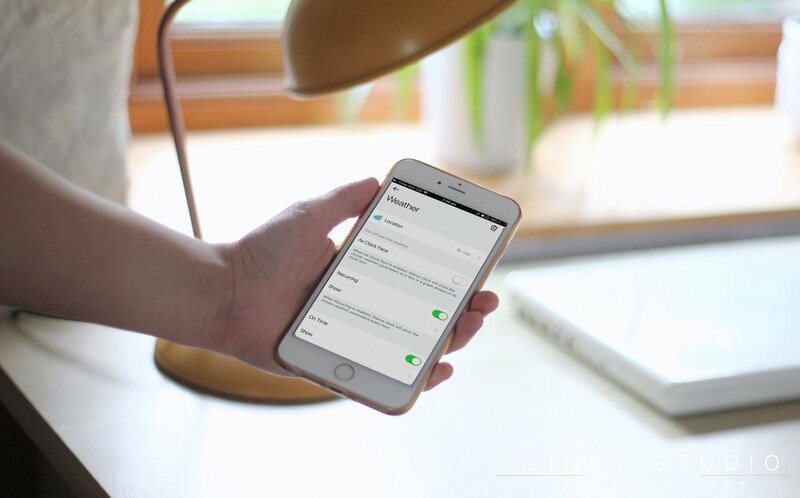 However, certain widgets decide to become intermittent and Bluetooth connectivity can often drop off and fail to reconnect without some assistance. So the things we really like are features like calendar reminders from iCal, Google Calendar and Outlook. A reminder of something like a meeting coming up will emit an audio note and scroll across the clock's surface - really handy. Another useful addition we liked was the ability to be notified of an incoming call. Often we store our phones out of sight and out of ear-shot, hidden away in a drawer at the studio, and the Glance won’t fail to be heard! For British tastes the ability to see temperature and humidity levels will be warmly welcomed too. Seeing these nudging notifications at a literal glance is neat and non-intrusive when you’re doing something totally outside the realm of the internet. IFTTT integration is up and running now - basically it enables the use of third party widgets like smart kitchen appliances, such as an oven which can alert when it’s finished; or it can highlight a sports team result; or even when it starts raining outside. Such widgets can be a tad fiddly to set up and don’t always operate as they should. But the intention for a large variety of service tie-ins is wide open and is an exciting area for wider appeal. Amazon Alexa interrogation is also offered now too, and is something we hope to try in the near future and report back on. We can see how Glance Clock could stop much heavy smartphone usage over the course of a day. Notifications are what often draw us to have a quick look at our smartphones - and before we know it 40 minutes have passed and you’re looking at a list of people who have lived in airports on an obscure Wikipedia entry, or some other such trivia. So if at a glance we can be fed the same info without the addictive edge, this will find millions of walls to hang on. But it has to be a rock solid experience that has the compatibility with Apps and services in a similar way to the App Store and that’s the real upward trek for the Glance Clock. Glance Clock, in this current variation, isn’t quite ready for mass market adoption; it has bugs and functionality quirks. But overlooking this, we can see the green shoots of a fantastic idea that with a little more polish could one day become a category in itself, just like the smartphone.